Jupiter, that blustery ball of noxious gas, is probably the last place that comes to mind when you hear the words “life supporting.” But for twenty years, astronomers have suspected Jupiter of doing just that: supporting life on Earth, by shielding us from destructive comets. Now, one scientist is saying that’s dead wrong. Indeed, the so-called Jupiter shield hypothesis hasn’t held up under scientific scrutiny, and Grazier’s latest JPL-funded research, which appears next month in the journal Astrobiology, may lay the idea to rest once and for all. His models show that Jupiter doesn’t—and never has—protected Earth from unruly space rocks. Rather, the prodigious gravity of Jupiter and Saturn has been slinging icy material our way for eons. What’s more, those comets probably delivered the water, oxygen, and other volatiles that are essential to life as we know it. Without Jupiter’s rain of cometary terror, life on Earth may never have evolved. The idea that Earth’s largest neighbor protects us from deadly impacts traces back decades, to models published by astronomer George Wetherill in 1994. Curious to learn how Jupiter influences the distribution of planet-forming material in its cosmic neighborhood and the ejection of comets from the solar system, Wetherill performed a series of numerical simulations. Wetherill’s models showed that if Jupiter didn’t grow into a fully-fledged gas giant, but instead devolved into a “failed” core—which would still weigh an impressive 15 Earth masses—there’d be a thousand times more icy material whizzing about the inner solar system today. He didn’t conclude that Jupiter shields Earth from deadly impactors, simply that the gas giant helped sweep stray, planet-forming particles out of the ancient inner solar system. Nevertheless, some astronomers took his models as evidence that Jupiter is our planet’s cosmic barrier, and the idea stuck. For the past fifteen years, models by Grazier and others have debunked pieces of the Jupiter shield hypothesis. To lay the matter to rest once and for all, Grazier decided to revisit Wetherill’s original models and give them a 21st century upgrade. He put 30,000 hypothetical particles on orbits between Jupiter and Neptune, and tracked their fate over 100 million years. Simulations of this magnitude weren’t possible in the 90s, but, Grazier says, thousands of particles and millions of years are needed to come to robust conclusions. The new simulations show that significant fraction of particles evolve into Earth-crossing orbits over time when gas giants are present — flipping the Jupiter shield hypothesis on its head. Grazier’s models also demonstrate that Jupiter and Saturn “assist” one another in delivering material to the inner solar system, in a way that wasn’t appreciated before. It’s the complex gravitational dance of the two gas giants that hurls icy material onto our cosmic turf. And strangely enough, that might be a good thing when it comes to habitability. “These models show that a lot of material gets kicked into the inner solar system—material that can form atmospheres and hydrospheres,” Grazier said. 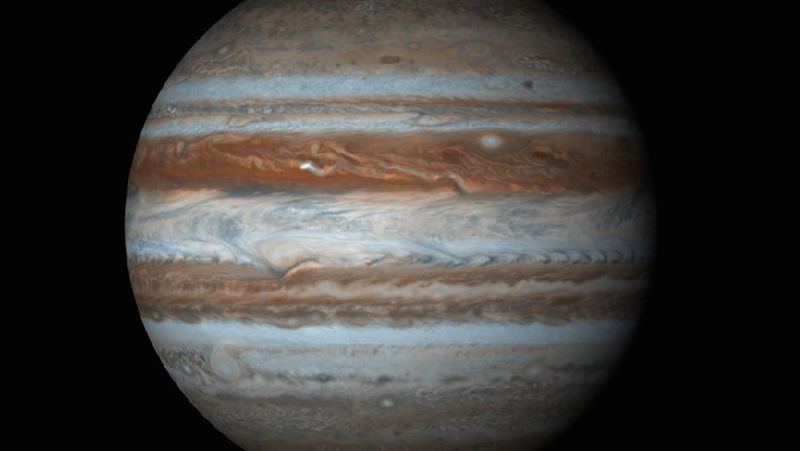 Astrophysicist Konstantin Batygin of Caltech agrees with Grazier’s main conclusion — that Jupiter doesn’t protect terrestrial planets from comet impacts — but offers one caveat. His work shows that during the very early Solar System, when a thick nebula of gas still surrounded our Sun, Jupiter’s inward migration swept rocky planetesimals into the Sun, effectively clearing out the inner solar system. Not only could Jupiter’s violent primordial dust-busting activity have destroyed an ancient population of Super-Earths, it might have set the stage for the formation of Mercury, Venus, Earth and Mars, as Batygin argued in PNAS earlier this year. Jupiter’s relationship to the terrestrial planets is undeniably complex, but from the perspective of a life form on Earth, it seems to have been a positive one — overall. And as we peer into distant star systems in search of other habitable worlds, that knowledge could help guide us. Strangely enough, stars harboring tempestuous, somewhat vindictive gas giants might be the right places to search for a second home.